A common scene: you are leaving for work or an important date and your car is refuses to start; you turn the ignition several times in vain. Do not despair! It isn’t a car servicing call – this is probably just a low battery. But, you might wonder how you landed up with reduced battery power without any fault of yours. There are several causes for bad battery in your car and your role is an important factor here. Afterall statistically, driving habits rather than battery defects are often the reason for battery failure. A car company reveals that out of every 400 battery operations they undertake 200 are just fine! Other causes of failure include low charge, cold weather, car alternator problems, sulfation and acid stratification. A car battery is an electrochemical device that creates energy using an alternator that stores electric power and reloads itself when it is charged. Regular testing and maintenance of a car battery is essential to enhance its life and performance. Read this article to know how to take care of your car battery. To know that your battery is dead, try turning on the ignition or switching on the headlights. If neither of this works, then you are in for some repairing work! The battery can also be low and the lights may flicker or the radio might produce minimized sounds. The only way to test a battery’s performance is to examine the voltage output it is offering. The output that it provides with and without load can give you an idea about its health. Sometimes, it might just be the cold weather that causes damage to the battery and all you need to do is visit the repair shop and warm the battery! When bringing the battery indoor, always set it safely to prevent acid damage. If you seriously have a problem, get ready with a voltmeter, set the dials on 0-50V range. Disconnect the battery from the car connections, by following the instructions given in the car manual. Don’t attempt this without the manual or else you might end up irreversibly damaging some cables. Attach a 9V alkaline battery to the car PCM (Pulse Code Modulation). This ensures that the car retains its programmed settings. Connect the red lead of the voltmeter to the positive of the battery terminal and the black lead to the negative terminal. By checking the voltage level, you will understand what your car requires. If the range is between 12.6–12.8, then your battery is doing fine. If it is anything below, it needs charging! Next, reconnect the battery and try starting the car. Keep checking the voltage reading between the same points. If the power still doesn’t cross about 10V, then there are some other problems causing the decline. At the same time, check fluid levels in the battery. To do this, you must disconnect the battery again. To begin, open the battery cover and look into the contents. The electrode plates must be drowned in the electrolytic fluid (if you don’t know how to do this, consult a mechanic!). Add distilled water until the fluid level rises to about one fourth of an inch above the plate. Thus, you’ve checked the car battery and now you need to reconnect everything and restart the car. 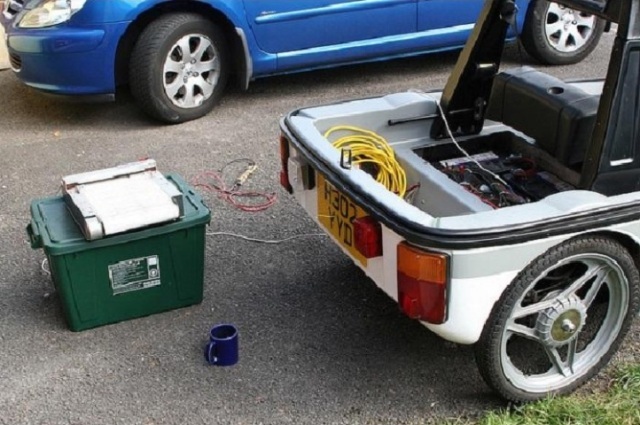 This method of testing your car battery is easy and gives you a good amount of experience with the car for use in case of any future problems.